“Irena’s number. 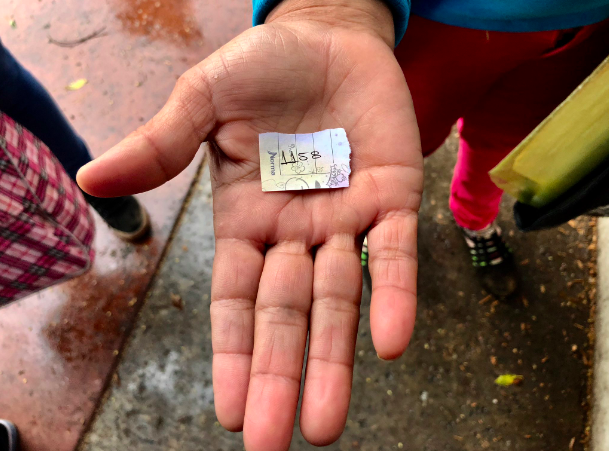 Her place in the growing line of asylum seekers in Tijuana hoping to make their case to US officials. She fled her town in Mexico after gangs kidnapped her brother (now missing two months). She said she was next,” The World’s Monica Campbell tweeted. “Her number wasn’t called today. She’ll return tomorrow.” Photo credit: Monica Campbell. Weeks after the caravan left San Pedro Sula, no one can agree on who the real organizer is, leading to misinformation and low morale among the group, reports The San Diego Union-Tribune. Migrants who may have had a strong case for asylum in the past, are facing new challenges. Women in the caravan who fled domestic violence are in legal limbo, given that many are accepted into initial asylum proceedings, but rarely receive asylum since a June 2018 ruling by Jeff Sessions declared domestic violence is not grounds for asylum, reports Broadly. The asylum wait is driving some migrants to take desperate actions. Last week, a group of 15 women announced a hunger strike to protest the long wait times to apply for asylum and demand expedited humanitarian visas and an increase in the number of applications processed each day. As the waitlist to ask for asylum in Tijuana has climbed to more than 5,000 people, dozens of migrants in the caravan have decided to cross the U.S. border illegally instead of waiting for their applications to be processed, BuzzFeed News reports. Migrants who cross the border can be charged with a misdemeanor for illegal entry, forcing them to serve time before being deported or beginning asylum proceedings, The San Diego Union-Tribune reports. Many of the migrants who have crossed were apprehended by Border Patrol, but it appears they have not been charged. Thousands of caravan migrants were moved to a new cleaner and more spacious government shelter in Tijuana last week, an upgrade from the conditions of the previous filthy encampment but farther away from the port of entry where they must seek asylum. The Mexican government is spending about $23,000 a day to house and feed the estimated 6,000 migrants there, reports The Washington Post. As migrants wait in Tijuana to apply for asylum or for their asylum applications to be processed, shelters provide hope in the form of a home-cooked meal, a new set of clothes and legal advice, reports Harper’s Bazaar in a photo essay. A smaller group of about 300 migrants have turned to a migrant shelter in nearby Tecate to escape from the chaotic experience of traveling with a caravan of thousands of people, reports LA Times. Many of the people in the caravans are women fleeing Central America. They traveled with kids, partners or alone but they all said they hoped for a safer place and a job. Over the last month, The Wall Street Journal spent time with some of the women and produced a compelling photo essay. The Trump administration is considering a proposal to charge immigrants already residing in the U.S. $50 to process asylum applications, reports BuzzFeed News. If approved, the U.S. would be one of the few countries to charge. Lawyers have criticized the proposal for making it more difficult for immigrants to access their right to asylum. A record high percentage of asylum cases were rejected in 2018 at 65 percent, reports CBS News. Fiscal year 2018 also saw a record 42,000 asylum cases decided, the most since 2001 when statistics became available. Immigration policy researchers say an immigration backlog and pressure to speed up the system could indicate that asylum seekers are being denied their right to due process. Homeland Security Secretary Kirstjen Nielsen has asked for other Cabinet departments — usually tasked with guarding diplomats, national parks, and nuclear weapons — to join the law enforcement efforts at the border in response to the caravans from Central America, reports Politico. The move may be a way to skirt restrictions on the enforcement capabilities of the military at the border. New Mexico’s land commissioner has been in a stand-off with CBP over a plot that the federal government does not own and refuses to pay for, despite already building a border barrier there, reports Rolling Stone. Now, a new progressive land commissioner has taken office and some expect her to find a way to “stick it to the Trump administration” over the land. Tactics used to police the border and urban communities in the U.S. have developed side-by-side, reports CityLab. “Both communities face constant surveillance and threats to the civil rights of certain residents,” writes Tanvi Misra, who compares the death of Esequiel Hernández Jr., shot by a Marine near the border in 1997, and Michael Brown, shot in Ferguson in 2014. In one of his first acts in office, Mexican President Andrés Manuel López Obrador signed an agreement Saturday with El Salvador, Guatemala and Honduras to promote development and address root causes of migration in the region, reports AP. Experts expect immigration to be one of the first tests of his presidency, reports Politico, and many close to the administration say he is unprepared. Another major hurdle for López Obrador is reigning in a federal police force notorious for carrying out human rights abuses against migrants, reports KJZZ Fronteras Desk. In the past four years, nearly 4,000 migrants have died or gone missing in Mexico while en route to the U.S., about 1,500 more than the previous estimate from the United Nations, reports AP. As asylum applications in Canada have skyrocketed recently, the country is struggling to decide whether local governments or the federal government are responsible for paying for housing, education and health costs, reports Marketplace. In Denmark, plans are underway to house some of most unwanted foreigners on a tiny, remote island that is home to a crematory for a center for researching contagious animal diseases, reports the New York Times. “They are unwanted in Denmark, and they will feel that,” the immigration minister, Inger Stojberg, posted on Facebook. Southwest Key Programs, a nonprofit that provides shelters for migrant children, announced Tuesday that it has ordered an internal review, just days after a New York Times investigation detailed how the charity made millions off government contracts, particularly during the family separation crisis. The report said Southwest Key acted “more like a bank than a traditional charity,” but the nonprofit has denied any intention “to game the system.” In August Latino USA broadcast a #MustListen investigation into the moral dilemma of Southwest Key founder Juan Sanchez who served on the board of the National Council of La Raza (now known as UnidosUS) and who has been the recipient of multiple awards for his work with migrant children. “I’m a Latino and I’ve been fighting for Latino causes all my life,” he told Maria Hinojosa. A Russian immigrant who was placed on life support after he tried to hang himself in November died in ICE custody on Saturday, reports The Washington Post. Deaths while in immigrant detention have been increasing since 2014, with 12 deaths in ICE custody in 2017. Friends and family of a Mexican man residing in Colorado who committed suicide as he faced deportation in August launched a scholarship fund for undocumented students in his honor this week, reports Westword. The fundraiser also hopes to bring awareness to the emotional difficulties of facing deportation. A Haitian immigrant was released after two years in detention with the help of an Ohio couple who sponsored him and fought for his release without knowing him, reports HuffPost. The couple formed “Ansly’s Army” to push back against the arbitrary ways that the immigration system decides to detain immigrants for extended periods of time. The ACLU filed a lawsuit Monday against a county sheriff in Florida for illegally holding a U.S. citizen under ICE’s request, reports Miami New Times. The ACLU estimates that ICE wrongfully detains hundreds, if not thousands, of U.S. citizens each year. Local law enforcement officials are liable when they carry out these unconstitutional orders. This is what happened to a Philadelphia-born man who ICE wanted to deport to Jamaica and who is at the center of the lawsuit. A Massachusetts judge is being investigated for possibly helping a man flee ICEafter a hearing for drug possession and drunk driving in Newton, a sanctuary city, reports AP. State regulations require that court staff neither help nor hinder immigration enforcement. A federal appeals court rejected a law, on the books since before the Trump administration, that criminalizes anyone who encourages foreigners to enter or reside in the United States illegally on the basis that the law violates First Amendment rights, reports Politico. The Pentagon will finally send green-card holders to boot camp starting next week after a Trump administration policy that required them to undergo extra background checks was halted by an injunction issued in a California court, reports The Washington Post. The policy was controversial among military officials who recognized the contributions of green-card holders to the U.S. military. An estimated 6.8 million U.S. citizen children with an immigrant parent could be unenrolled from Medicaid health insurance because their parents fear they may be labeled a “public charge” when they apply for a green card, reports The Dallas Morning News. The Trump administration has proposed expanding the definition of who would be rejected for being a “public charge” to include non-cash programs like Medicaid, food stamps and housing assistance. A study shows that millennials are more likely to believe that immigrants bring diversity to America and less likely to believe immigrants steal Americans’ jobs compared to older generations, reports The Washington Post. This demographic also voted overwhelmingly blue in midterm elections, leading political experts to wonder if hard-line Republican views on immigration will permanently isolate this age group. Last week, a federal judge ordered the Justice Department to distribute funds to seven states and New York City, which argued they were denied the funds for refusing to comply with immigration enforcement, The Wall Street Journal reports. The judge named separation of powers as the reason for his ruling. The decision is consistent with other rulings on sanctuary cities. The attorney general of Texas filed a lawsuit against the city of San Antonio last week, arguing that the police department and city government obstructed federal immigration enforcement when it did not allow ICE involvement in a case involving a tractor-trailer with undocumented immigrants in it that was found last year, reports HuffPost. The case is the first test of anti-sanctuary city law SB4, passed by the conservative Republican legislature last year to penalize officials who do not cooperate with immigration enforcement.